SUBHEAD: Protesters against the Dakota Access Pipe Line occupy office of company participating in construction. Image above: Demonstrators offer "Embridge Lemonade" (actually cups of black oil) to employees of the company backing the Dakota Access Pipe Line at their Edina, Minnesota headquarters. Frame from video below in original article. "Enbridge, Inc. is an energy delivery company based in Calgary, Canada. It focuses on the transportation, distribution and generation of energy, primarily in North America. As a transporter of energy, Enbridge operates in Canada and the United States, the longest crude oil and liquid hydrocarbons transportation system in the world." From "Our Company Overview". Retrieved 16 August 2015. On September 29th, in Edina, Minnesota, community members and water protectors staged an action at Enbridge Gas Company's Edina office in solidarity with resistance efforts against the Dakota Access pipeline (DAPL). Attendees of the action were let into the lobby by an Enbridge Inc employee. 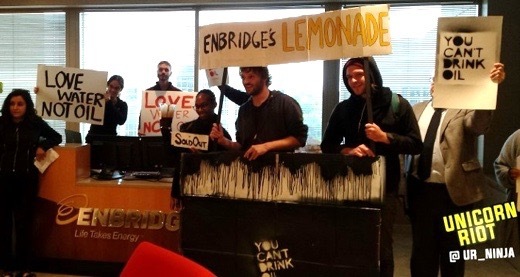 Signs and handouts containing a declaration against Enbridge and Dakota Access accompanied an “Enbridge lemonade stand”, from which cups of “oil” were offered to Enbridge employees. The declaration identified Enbridge, Inc. as the single largest financial contributor to the DAPL project. It also stated the intention of the people of Minnesota to continue to expose Enbridge’s irresponsible and exploitative business ventures, including the proposed Line 3 in Minnesota. While some attendees chanted “You Can’t Drink Oil” and “Love Water, Not Oil”, others approached every Enbridge employee in the mostly-vacant office. Each employee was given a copy of the Declaration, and asked if they wanted to drink a cup of oil. Video above: Demonstration against NoDAPL at the Edina Inc, Minnesota headquarters. From (https://vimeo.com/184938837). • And President Obama's Keystone Climate Test, by blatantly disregarding the associated greenhouse gas emissions and ensuing contribution to the climate crisis. It is unconscionable that Enbridge continue funding this illegal and dangerous pipeline. Today, we stand with our friends at the Sacred Stone Camp in resisting the Dakota Access Pipeline, and we will continue the fight against the proposed Line 3 here in Minnesota. We proved that Sandpiper was a bad investment, and so is Line 3. The people of Minnesota will continue to expose Enbridge's exploitative and irresponsible business investments until they cease endangering the our water, lands, and communities.